I don't have the engineering gene. I know this because, not only do I have several engineer-type friends who love nothing better than twiddling and fiddling and tweaking whatever their project of the day is, but I live with two people who have E-N-G-I-N-E-E-R spelled out in bold letters in their DNA. My husband, for instance, decided he wanted to make sourdough bread. Not just any sourdough bread, mind you, but the perfect sourdough loaf. He harvested yeast from the bottom of a bottle of beer—Doggie Claws from Hair of the Dog, to be exact—and made his own sourdough starter. Then he spent, oh, about two years testing recipes from various sources, none of which gave him the result he was looking for but which we were obliged to consume. Fortunately some friends (bless you, Kathryn and Jeff) gave him the Tartine Bread book (and bless you, Chad Robertson), which in no time at all sent him into a baking-in-cast iron frenzy and supplied us with divine homemade bread thenceforth. Of course, that didn't stop him. Oh, no. 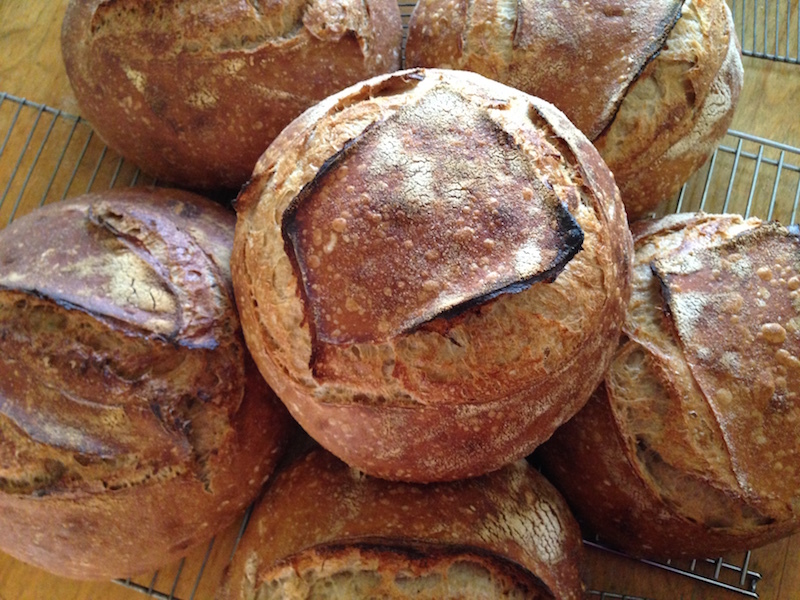 Since then he's experimented with various combinations of flours—all-purpose, whole wheat, barley, rye—from different places—Bob's Red Mill, Ayers Creek Farm, Camas Country Mill—to find out what effect they had on his loaves. He's tweaked the number of times he folds (not kneads) the dough, and how long it sits before he bakes it (currently at three days from start to finish). I'm telling you, this is so beyond my patience level. The sauté before adding liquid. 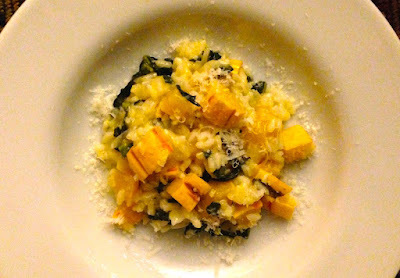 One example is squash risotto. Tried one recipe, it didn't really turn out the way I'd hoped, so I abandoned it. A year or so later, tried another one, was disappointed again. That pretty much ended my interest in experimenting. Then one evening there were a couple of delicata squash that had been sitting on the counter and needed to be used, so I thought, well, why not. The skin of delicatas, as you probably know, aren't tough and can be eaten without peeling. So, remembering a beet risotto recipe that starts with raw beets, I whacked them into half-inch cubes and tried one…last…time. A half hour or so later, I brought it to the table and…it was great! And while it may not be a whiz-bang, James Beard-award-ready version, I think it's pretty darn good and meets my non-engineer standards for a one-dish, hearty and tasty meal. But those of you who do have that fiddly, twiddly, tweaky bent can feel free to have at it. I'm happy with it as is. Heat oil and butter in deep skillet over medium-high heat. Add onion and sauté until tender. Add garlic and sauté briefly until fragrant. 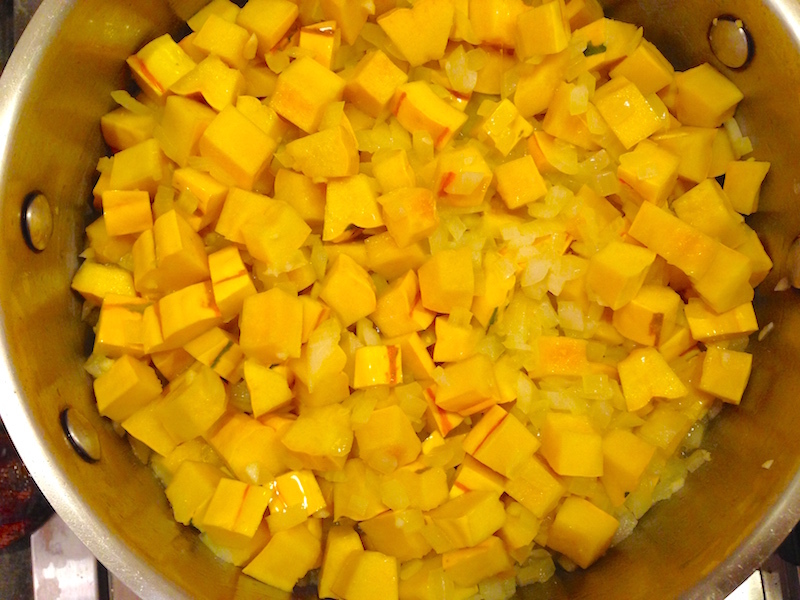 Add rice and sauté for a minute or two, then add squash and white wine. Stir until wine is absorbed, then start adding stock a ladle at a time, stirring often (though you don't have to stir it constantly). As each addition of stock is absorbed, add more until the rice is tender but still has a little crunch. Add greens and stir until it wilts. Add 1/2 c. cheese and stir. Serve. * I also made this recipe using roasted, peeled and cubed Sibley squash and it was terrific, so feel free to sub in your favorite squash.